Almond, David. The Savage. Illus. Dave McKean. New York: Candlewick, 2008. Print. Summary: Blue’s father dies. To help Blue cope with his grief, the school counselor encourages him to write in a journal. 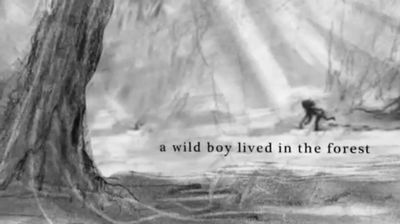 Rather than write about his feelings, Blue delves into a fantastical story about a savage boy who lives in the woods nearby. Overtime, Blue’s life and the Savage’s life begin to overlap with frightful results. Blue might be able to heal from his grief if he can tame the beast within. Critique: To date, I have yet to find a mixed-format book I did not like. 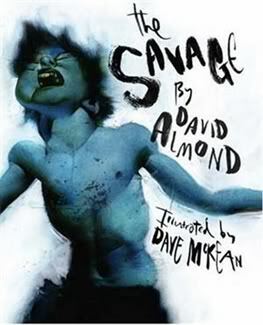 Mary Losure’s Wild Boy, Patrick Ness’s A Monster Calls, and now David Almond’s The Savage add to a growing list of what I call “cocktail” books because of how they combine and shake up different storytelling mediums. Books that mix novel prose with graphic art panels make for an intense and dynamic means of storytelling. Pictures may or may not play off the words. In some cases, they may strike a direct counterpoint to the text, rambling off to tell their own tale. But the dissonance allows younger readers to become more sophisticated consumers of complex stories. In this “cocktail” book, Dave McKean’s artwork is bold, splattered, and smeared. It invites the eye as much as it repels and repulses. How appropriate considering how our subconscious mind can have the exact same feel. All at once, it can lure us in with the promise of reckless abandon, while simultaneously disgusting us with its nightmare parades! The most immersive textual parts of this story come from Blue’s journal entries. In these sections, we find Almond’s masterful ability to capture the perspective, voice, and aching soul of a young narrator. Almond achieves similar brilliance in The True Tale of the Monster Billy Dean as Telt by Hisself. But there are other sections of text written from a more mature and knowledgeable Blue. These sections feel less intimate and a little too self-aware. For those who know Ness’s A Monster Calls, this book will feel indisputably similar. Both deal with young boys undergoing personal turmoil and acrid grief that manifests in monstrous forms. Both boys deal with bullies. Just like Conor in A Monster Calls, Blue transforms into the Savage (his monstrous subconscious) to confront and fight his bully. In both books, fighting violence with violence drains much of the emotional resonance out of the story. There seemed to be a missed opportunity for empathy. For all anyone knows, these bullies endure an abusive life at home more savage than anything Blue or Conor have ever known. What impact would it have on the protagonists to witness their oppressors becoming the oppressed? Besides, the real fight in either story is not with some external demon, but with the monster that lurks inside the heart of every human.